Ships from New Hampshire only. 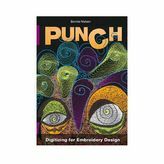 In “Punch – Digitizing for Embroidery Design,” author Bonnie Nielsen explains in depth all aspects of the embroidery design process from, the basics to advanced creative embroidery techniques. It is full of practical information and important tips about how to create good quality designs for industrial embroidery machines. Regardless of digitizing skill level and for anyone just interested in learning about the process of embroidery design, this book is a valuable source of inspiration and technical advice.